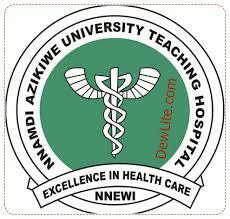 Application are invited from suitably qualified candidates for admission into three (3) year General Nursing Programme of the School of Nursing, Nnamdi Azikiwe University Teaching Hospital, Nnewi. Biology at not more than two sittings. 1. Make formal application to the Principal, School of Nursing, NAUTH, Nnewi with certified passport (black and white) photograph (4copies). 3. Pay Eight Thousand two hundred naira (N8200) to NAUTH cash office and obtain a receipt. Attach your photograph to the original receipt, make a photo copy and return the photocopy of the receipt to the admission office, School of Nursing, NAUTH, Nnewi. 4. All completed forms should be submitted latest Friday 12thMay 2017. Venue: Anglican Girls Secondary School, Nnewi Anambra State. NOTE: Bring along with you: pencil, eraser, ruler, pen and original receipt issued by NAUTH Account with gummed passport photograph.